Welcome to Jazz Course with Irina! Yes, these classes are suitable for complete beginners, but experienced dancers are also welcome in this course! This is a Jazz Course for Adults. The class consists of warm and pre-stretches, followed by jazz exersises and working on improving the technique of kicks, spins and jumps. We will continue into learning a short routine. You can only join this course in Week 1 and 2 if you have no previous experience as we will be adding on to the routine evey week. By week 7 you will have a short choreography demonstrating your new skills. Below are some videos of the more advances routine from my Auckland team. Scroll down to see the different styles of the choreographies that I do. Women and men are welcome in this class. Jazz dance is an umbrella term that can refer to several related dance styles. All of them are connected via common roots, namely tap, ballet, jazz music, and African-American rhythms and dance. I lean towards teaching more lyrical jazz ( smooth and slower) danced to slow pop or rock music. Jazz dance originated from the African American vernacular dance of the late 1800s to the mid-1900s. An early popular “jazz dancer” was vaudeville star Joe Frisco in the 1910s. He danced in a loose-limbed style close to the ground while juggling his derby, hat and cigar. Until the middle of 1950s, the term “jazz dance” often referred to tap dance, because tap dancing (set to jazz music) was the main performance dance of the era. During the later jazz age, popular forms of jazz dance were the Cakewalk, Black Bottom, Charleston, Jitterbug, Boogie Woogie, Swing dancing and the related Lindy Hop. Today, jazz dance is present in many different venues and different forms. 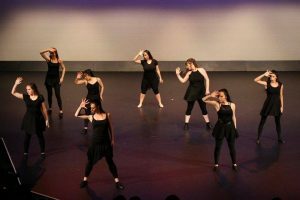 Jazz dance thrives in dance schools and remains an essential part of musical theater choreography; it is sometimes interwoven with other dance styles as appropriate for the particular show. Jazz dancing can be seen in some music videos, and even a number of Las Vegas showgirls are jazz dancers. Jazz Dance can also be seen on the hit show, “So You Think You Can Dance”, and is performed by dance companies around the world. I recommend to bring a bottle of water. You can bring cash and pay $10 at the door for each individual class or purchase it online by following the link on the bottom of the page. Save money and prepay a a full course for $55 by following the link at the bottom of the page. Please note that there are no refunds on missed classes, it is your responsibility to make sure that you can attend the whole course. Please always check the timetable for any changes. To give us enough time to process your purchase, please buy your course by midday of the first class date.